We passed popular eateries, including classic Taiwanese food, pastry stores, and of course, dumpling shops. 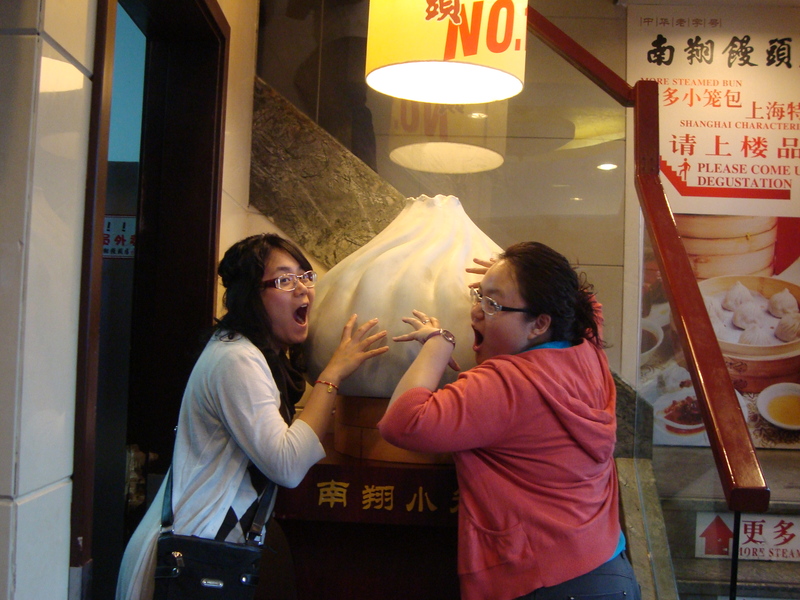 Qing Qing and Xiao Chen took us to eat Shanghai’s best: 小籠包 Xiao Long Bao. The best steamed soup dumplings I’ve had in America are in Joe’s Shanghai (locations in Flushing and Chinatown, New York). 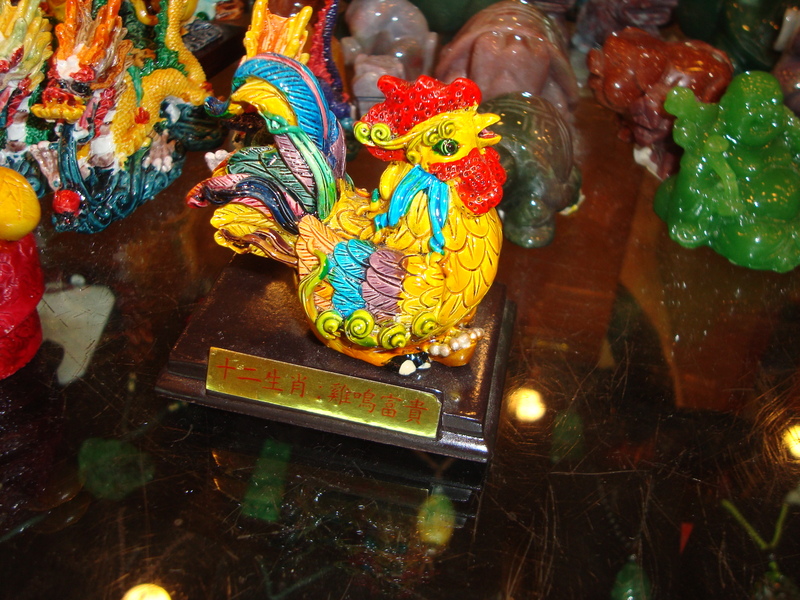 However, nothing beats the real deal straight out of Shanghai. 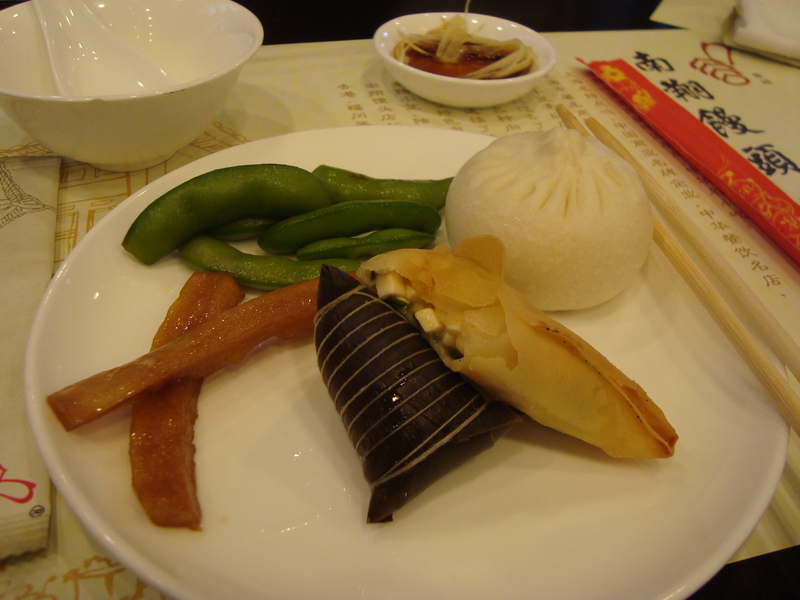 Thus, the highlight of our mega-lunch was Xiao Long Bao! 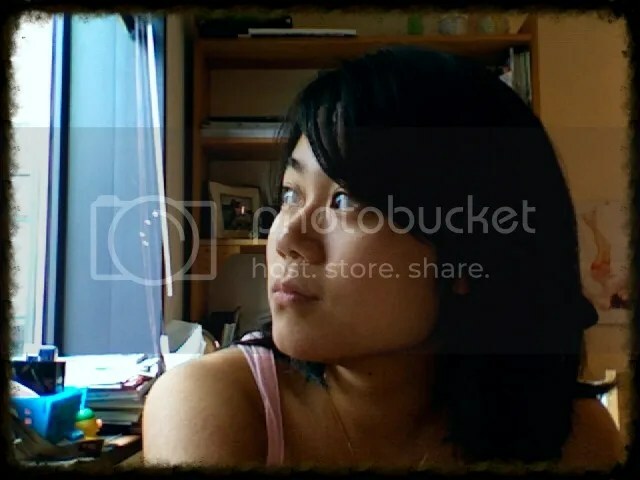 It is not like any ordinary dumpling, you can be sure of that. The skin is relatively thin and tender, and the best elasticity comes from the hand-rolled dough. 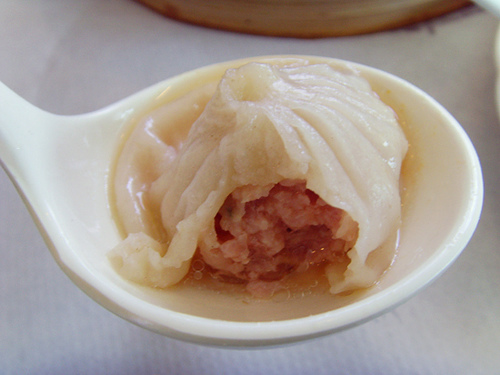 The filling is typically pork meat, but other variations include seafood, chicken, or vegetables. Aspic, or gelatin derived from meat stock, is stuffed with the meat filling. After steaming in bamboo baskets over a fluffy bed of Napa cabbage, Xiao long bao is ready to be served. 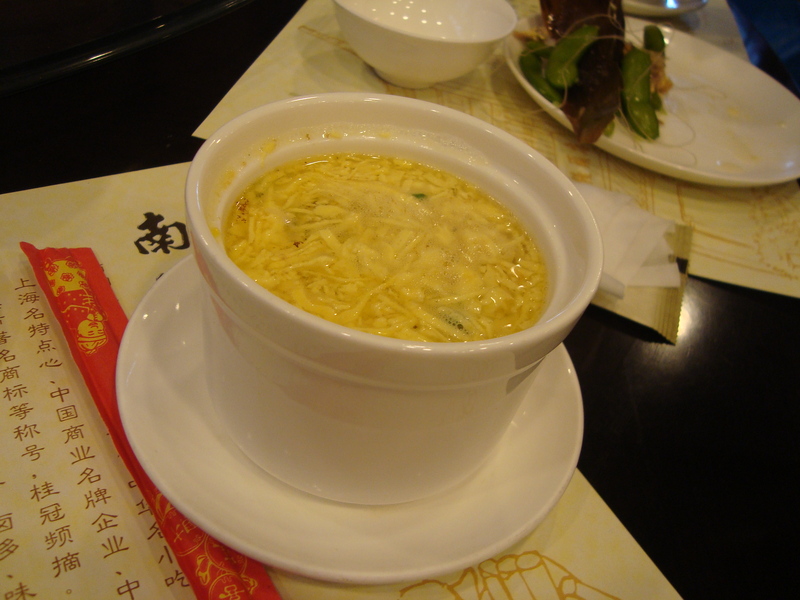 The gelatin inside melts into the savory soup characteristic of these special little dumplings. How do you properly eat these cute gems? It can be topped with ginger slices and black rice vinegar (Chinkiang vinegar) for additional spice and flavor. You have to be prepared with a rice bowl and soup-spoon. And you also cannot get too ahead of yourself and over-excited, because a hasty bite will brutalize your tongue and taste buds for the rest of the week. Take it slow and easy, and you will be in Shangri-La just as quickly. It was so gratifying to eat such good food. 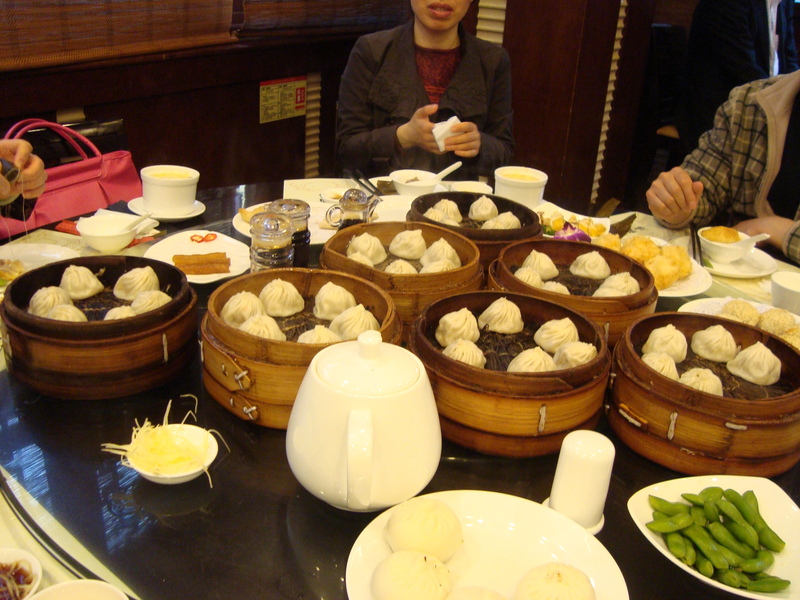 First the baskets and baskets of Xiao Long Bao dumplings, multiplying like mitosis! 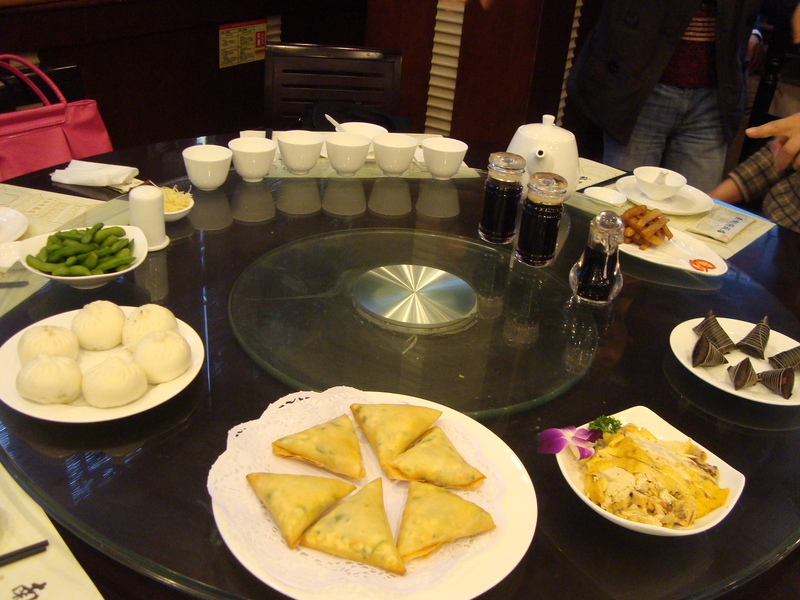 There were also a plethora of delicious appetizers: soybeans flavored in alcohol (not enough to get drunk), crunchy soy-sauce radish, mini Zhong-zi, crispy triangular spring roll with tofu, vegetable Bao-zi buns, and smooth egg soup. OH food coma never felt so auspicious! Giving Xiao Long Bao a BIG hug and bite! 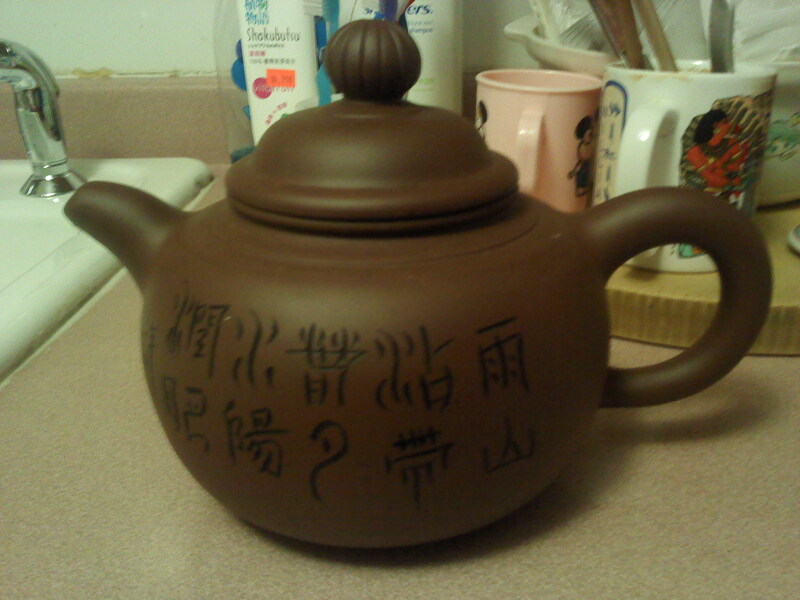 Kelly and I wandered around the shop while Mom and Xiao Chen were eyeing and bargaining over the precious teapot. 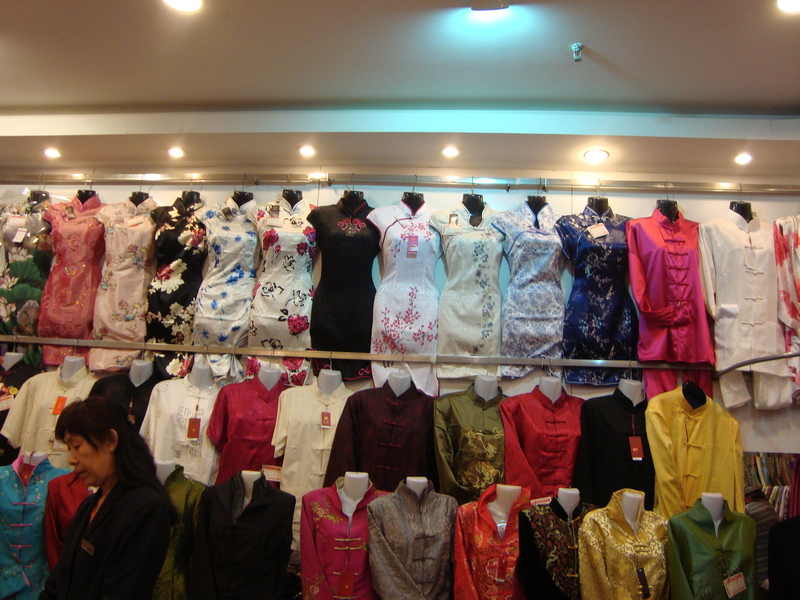 There were some cute items, like matching clothing and cell phone charms for couples. 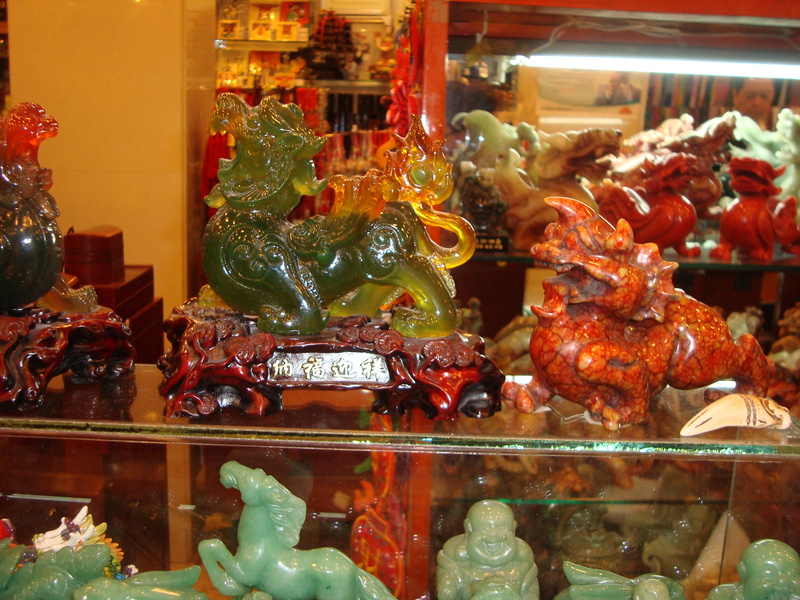 We played with some silk robes and mused over the finely hand-crafted jade and stone artifacts. We liked the artwork and decorations and would have bought some, if Kelly and I had a full bank account. Speaking we do not have overstuffed pockets of Benjamins, I took pictures as our souvenirs and hope for the Benjamins some day. There was a puppet show happening nearby. Back in the old times, these puppet opera shows were popular in Northern China, the typical outdoor entertainment for the young and old alike. The paper puppets were made very thin and carefully cut/designed and attached to strings that the performer could control. Behind a thin screen, the entertainer sang opera songs while moving the paper puppets. It was a meticulous job to entertain, to sing and play with paper puppets. 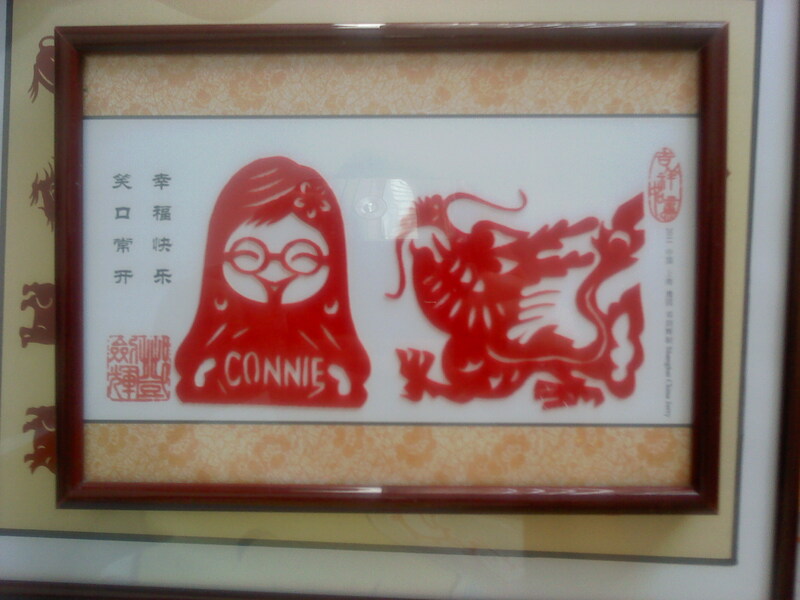 We also bought pretty souvenirs from an art stand. 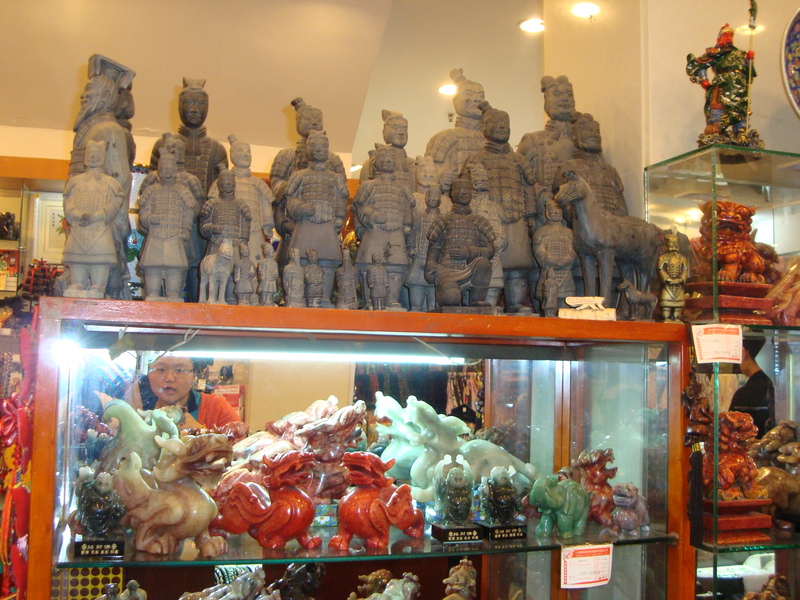 We saw Chinese men decorating eggs, sketching faces with immense detail, and cutting paper. We stopped to watch the paper-cutter. 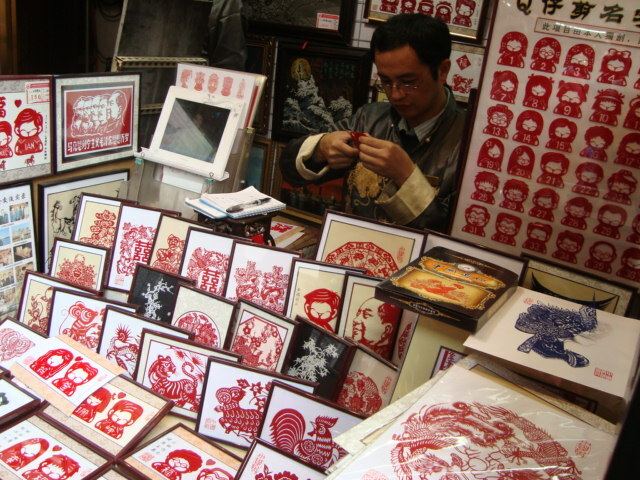 I was amazed by the Chinese art of paper cutting this man (Jerry) was demonstrating with talent and expertise. 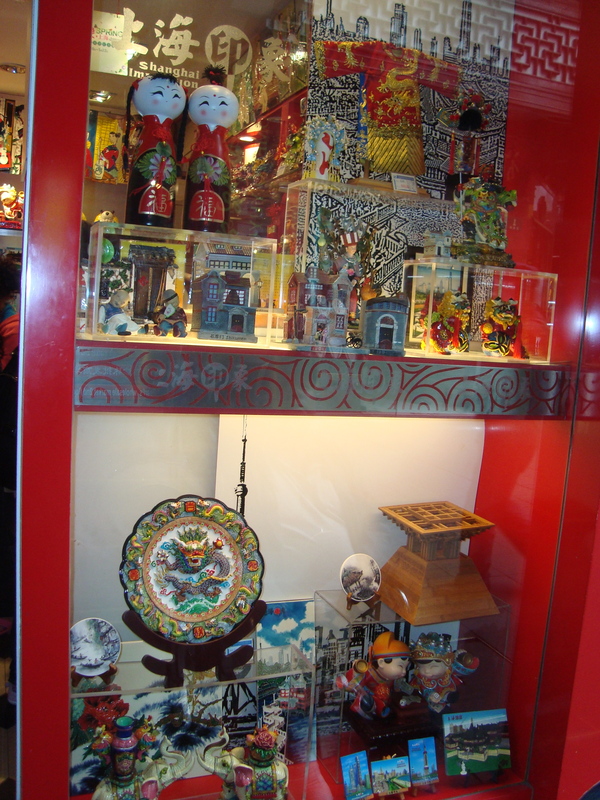 On display were a selection of his finished products, including cartoon couples, animals of the Chinese zodiac, Mao Zedong, and Chinese symbols and characters of meaning. He asked Kelly and me for our names, our zodiacs, and what figures we liked. Next, he took a small, sharp scissor and started snipping away at the little red paper. With skill, speed, and detail, he created our cartoon figures. I was impressed. Chinese people really DO have the hands of God. Maybe this artistic Jerry could fare well in surgery! 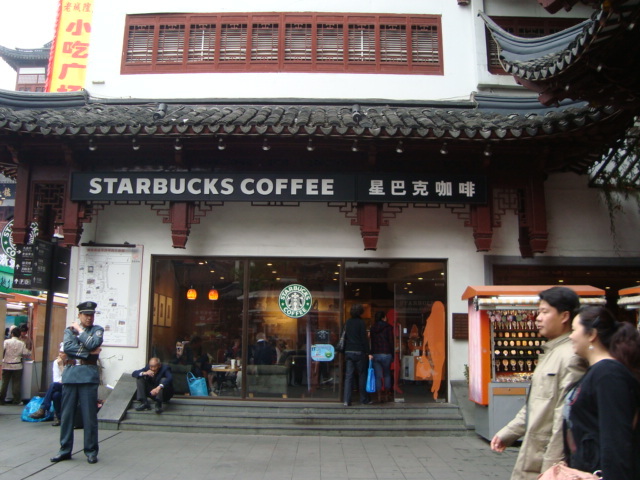 Starbucks has infiltrated Cheng Huang Miao yet again! We were such shoppers. 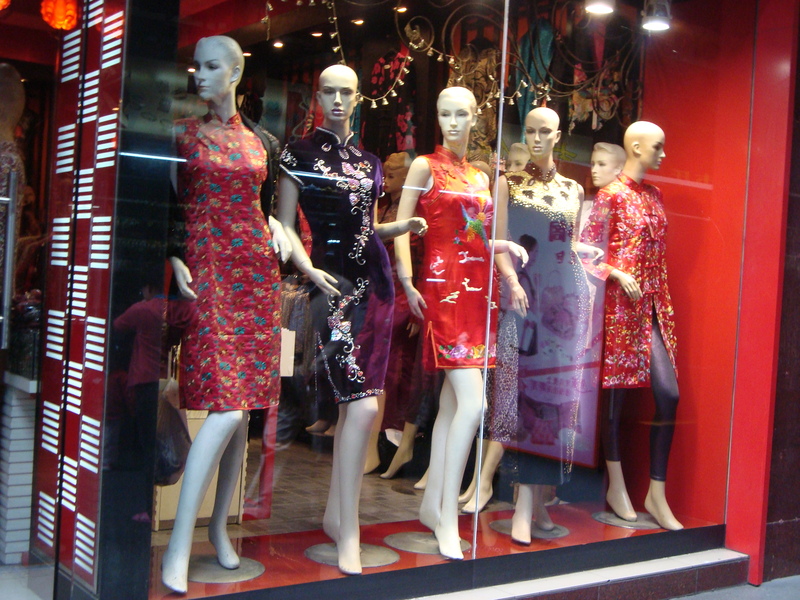 Once we entered a market, we were not bound to leave. Mom came out with a bundle of shoes. She went in and out at least three times. 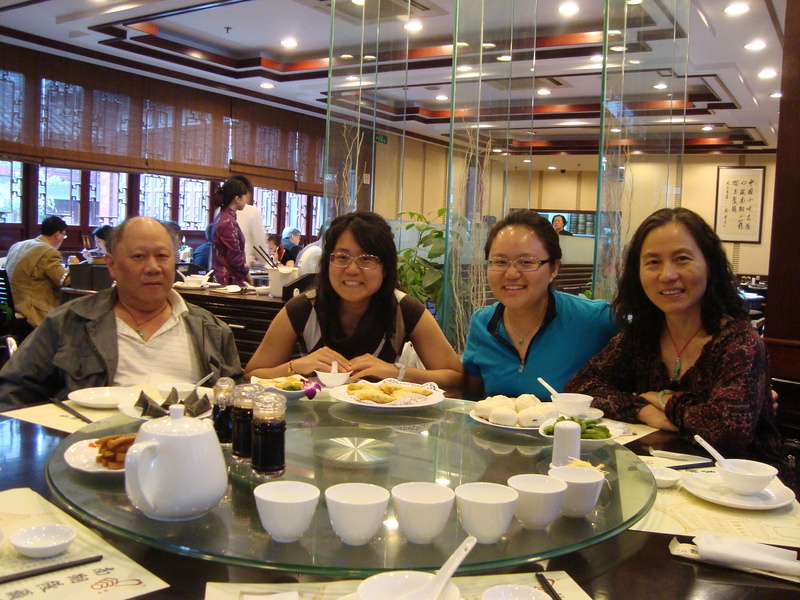 The first time, Mom and Kelly bought some sandals, while I chatted with Qing Qing along the side. Then she showed me the nice flip-flops, and I could not resisted, though I really did resist and Mom tempted me with nice shoes. So I went in with her that second time, from which I came out with woven flip-flops and white Croc flats. After we came out and Kelly saw my nice Crocs, she wanted a pair too. There was the third time. I bet that lady was rather amused and happy with the business she was earning from us. Other things we bought collectively: I got a purple, checkered shirt perfect for leggings, Kelly got black-and-white checkered skinny jeans, and Mom got more leggings. And Dad? 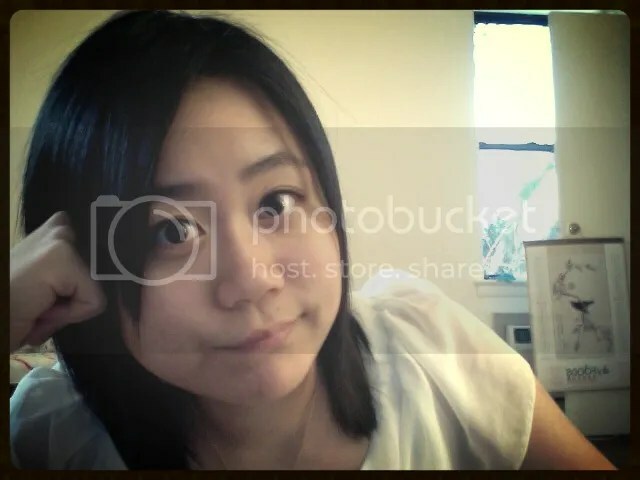 Most of the time he just could not get through the narrow markets, so he sat in his wheelchair on the side streets, accompanied by Xiao Chen or Qing Qing. 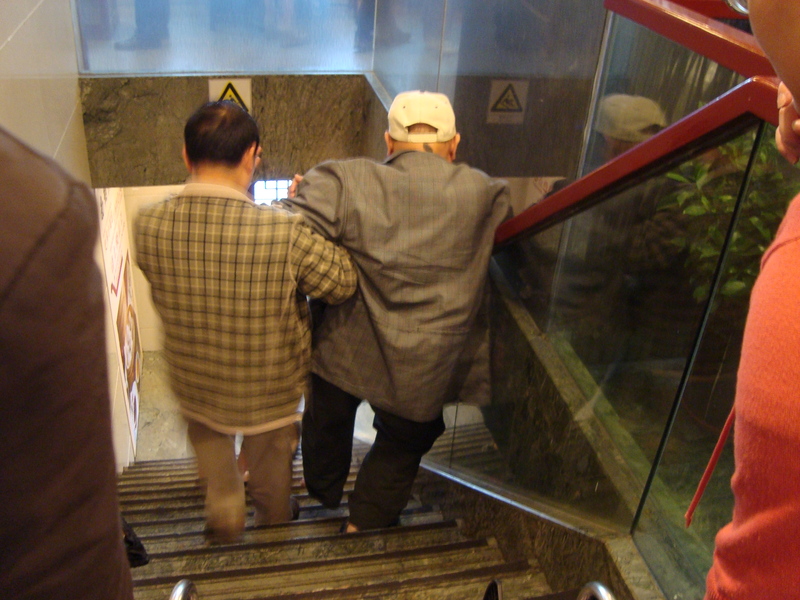 Even when we were at the restaurant, he had a terribly slow time getting up the staircase. Yes, staircases! No elevators or ramps. He was stuck getting from floor 1 to 2 the old-fashioned, energy-burning way. It was not a short staircase either; it was a mighty long trip up AND down. 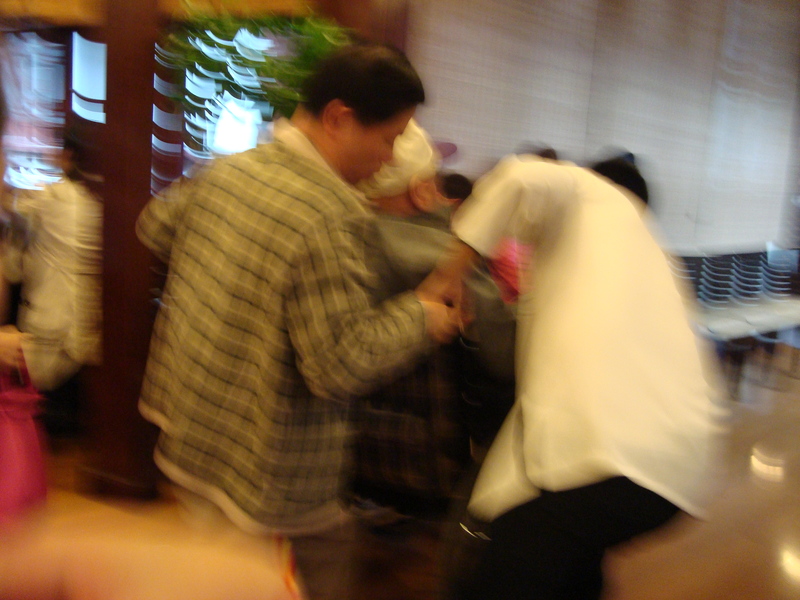 Lucky he had manly restaurant waiters to lift him over three entrance steps, Xiao Chen to support him with each limping step, and us to carry his hefty wheelchair.